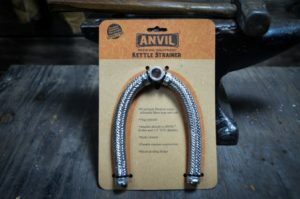 This week I take a look at the Anvil Kettle Strainer, which is actually a pretty efficient way to separate your hops and trub from the wort after the boil when beer brewing. As I covered in an earlier article, I upgraded to a Blichmann BrewEasy 10 gal system last year when I transitioned to electric brewing. Full disclosure: John Blichmann is both a sponsor of my podcast and a friend, so I asked him what worked best for separating hops from my wort so it won’t plug up my therminator plate chiller? John told me to get an Anvil Kettle Strainer. I was a bit skeptical. Originally I looked at purchasing a hop basket which is simply a screen basket that you hang in the kettle, but I also knew by experience that these can be a bit of a pain as hops tend to gum up the screen and sometimes create a complete blockage. It is always a delicate balance trying to get a screen with the right size to block the hops without gumming up and reducing utilization. Other alternatives include hop bags, or some kind of hop blocker which attaches to the bottom of the kettle drain. Hop bags work well but obviously you need to keep purchasing new ones and also make sure you have the right size for the amount of hops you want to use. The kettle drain filters work similar to the anvil strainer but typically have a screen which again can gum up. Blichmann was insistent – so I got one of his kettle strainers which conveniently fits right over the end of the dip tube on his boilermaker kettles. 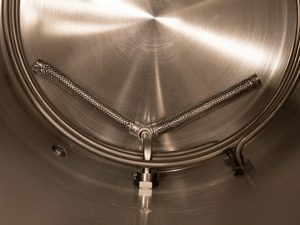 It has two braided stainless steel arms that provide a good wort flow but also filter out the hop bits. Honestly I was shocked that this sim ple device works as well as it does. I did not have to worry about bags or a screen jamming, and just added the hops directly to the kettle to get full hop utilization. Unlike a conventional screen or hop blocker, I get a steady wort flow through the strainer after the boil, and almost no hop bits in the finished wort. I always backflush my plate chiller immediately after use, but have found very little hop matter when backflushing. I believe it is at least as effective as a very fine mesh screen at eliminating hop debris, with the significant advantage of not being subject to blockage. I can usually draw all but the very thick sludge at the bottom of the kettle out getting as much wort as possible from the kettle post-boil. Obviously some very fine hop and grain bits still get through, but certainly not enough to cause an issue with your chiller, pumps or fittings if you properly backflush after brewing. The other feature I like is that the hop strainer is very easy to clean. You just remove it from the bottom of the dip tube and clean it with some PBW then flush it with water and it easily removes all of the debris. The hose is flexible so you can flex it a bit and under some moving water to remove and trapped debris. If you have thoughts on other ways to separate trub and hops leave a comment below! Thanks for joining me on the BeerSmith Home Brewing Blog. Be sure to sign up for my newsletter or my podcast (also on itunes…and youtube…and streaming radio station) for more great tips on homebrewing. Also check out the How to Brew Video series I shot with John Palmer if you want to learn more about all grain brewing. Kettle size brewbag – full hop utilization and you can squeeze the bag at the end (with gloves, of course). I wonder if that will work with a bigger batch? I use a 20 gallon kettle. My hopstopper is around 10 years old and still works great.